Consolidation. Lack of participation. Frustration. Apathy. This market continues to contract and volume continues to dry up. Even the RSI and Composite Index are showing totally flat levels. But this is where millionaires are made. Bitcoin continues to trade in a further and increasing constricted trading range. If we look at the current weekly chart, we can see almost no difference between the open and close of the current week for Bitcoin. Last week shows the same situation, with the close and open being the same as the close of 3 weeks ago. Volume has also dropped off and has continued to drop ever since the massive dump in mid-November 2018. To add to the consolidation, we can see that the current monthly candlestick is showing the tightest trading range since January of 2017. That is a significant piece of historical price information. If prices remain at this level on the monthly chart, then we are going to form an inside bar on the monthly chart. The RSI and the Composite Index are sitting in flat territory – a powerful sign of an impending breakout from the current price squeeze. Ethereum’s chart shows an even tighter trading range – if that were possible. Looking at last week’s candlestick shows an almost laughable difference between the open and the close for the week. Last week opened at 117.44 and closed at 115.01. And the current week is not looking any more or less constricted. In fact, the total trading for the current weekly candlestick is the single tightest trading range between the weekly high and low since April of 2017. Just as with Bitcoin, we are observing a continuance of an extremely tight trading range as well as significant volume dropping off. The same conditions that we see in the RSI and Composite Index in Bitcoin’s chart are present in Ethereum’s chart. It is entirely possible that the movement of major market cap cryptocurrencies like Bitcoin and Ethereum are not the charts we should be looking for evidence of the next accumulation and expansion phase. 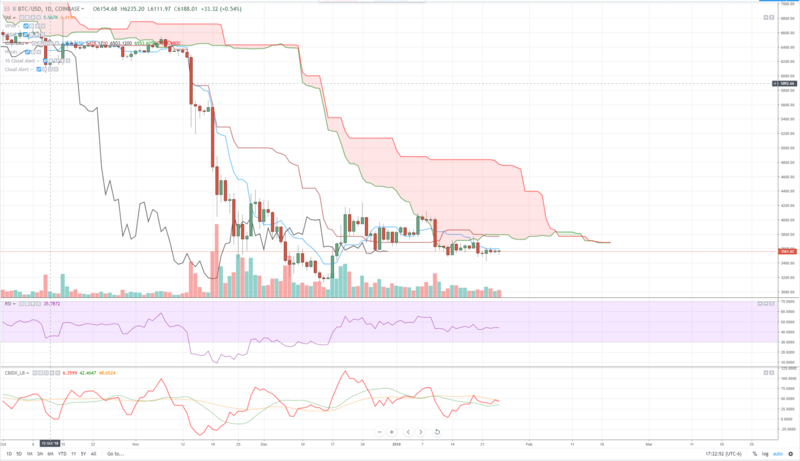 If we look at Litecoin and many of the other cryptocurrencies in the top 25 market cap field, we can see many sitting inside their daily Ichimoku Clouds. This is an important development because almost every single cryptocurrency has been trading well below its daily cloud for over a year – with many altcoins now moving inside the clouds. And while price being inside the Cloud is an inherently neutral condition, if we look at how often and with the frequency that prices have been rejected for even approaching the cloud, we could consider this most recent behavior bullish – or at least not bearish. However, we should also keep in mind consolidation is also a setup for continuation. In other words, more downside movement. But I would not be disheartened – the end of the ugliest and most drawn-out bear move in cryptocurrencies history is about to end. And we should all remember this: expansion moves and bull moves from bearish consolidation setup the future expansion and bull moves. All future expansions and bull trends from these conditions will be many times longer than the current length of the bear market and the price movement is always exponentially higher. This kind of market condition is where millionaires are made – when no one else is watching. Did you miss buying Ethereum when was trading at a 96% discount to its all-time high? Did you miss out on Bitcoin when it was trading at an 85% discount to its all-time high? Did you miss the massive parabolic move in 2013 and again in 2017? Don’t miss it again – because before you know it, this market will begin an expansion phase and you will have missed out on the lowest valuations and prices.